“I have had the luxury of napping with our grandson under one of your wonderful blankets.” I’d be fibbing if I said that didn’t make my day. Sandi did some exploring about The Green Sheep and then she wrote me. 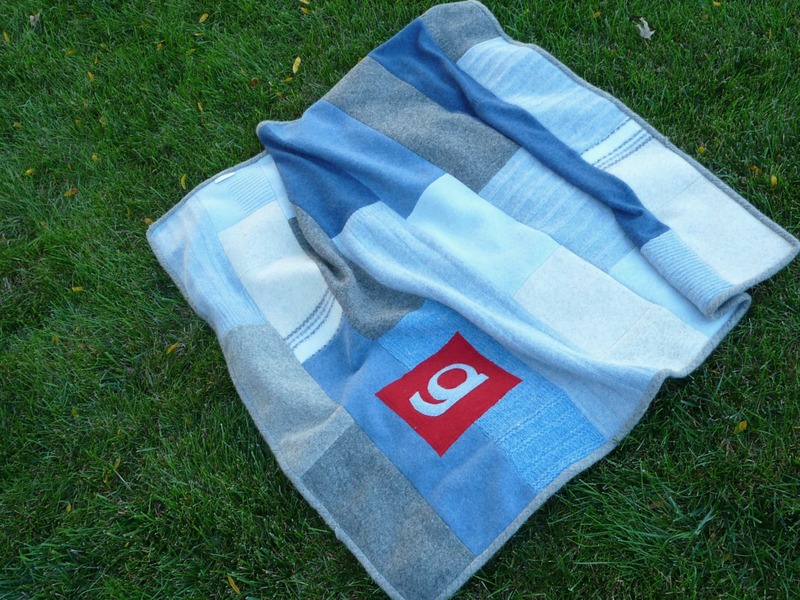 She said she had a brand new grand nephew and was hoping for a similar blanket for him. And she surprised me by attaching a photo in that very first email of little Griffin’s bedroom. Okay. Now this little guy’s bedroom has some wonderful creativity behind it. Rising on the wall by the crib is a hand-painted mural of stunning tall, gray, snow-capped mountains. Fluffy white clouds hover above them. And strung between two peaks is a red gondola, ferrying people through this majestic scene. That gondola is irresistible. Then I heard the story of Griffin’s parents and how the great outdoors brought them together. His father is from California and his mother is from Wisconsin, and she moved out west after college. But the event that caused their paths to cross was a little random. She was on a rafting trip at Lake Tahoe with girlfriends. The women got stuck — but were happened upon by some young men who helped free them. Among that group of guys was … well, the rest is history for this particular couple. 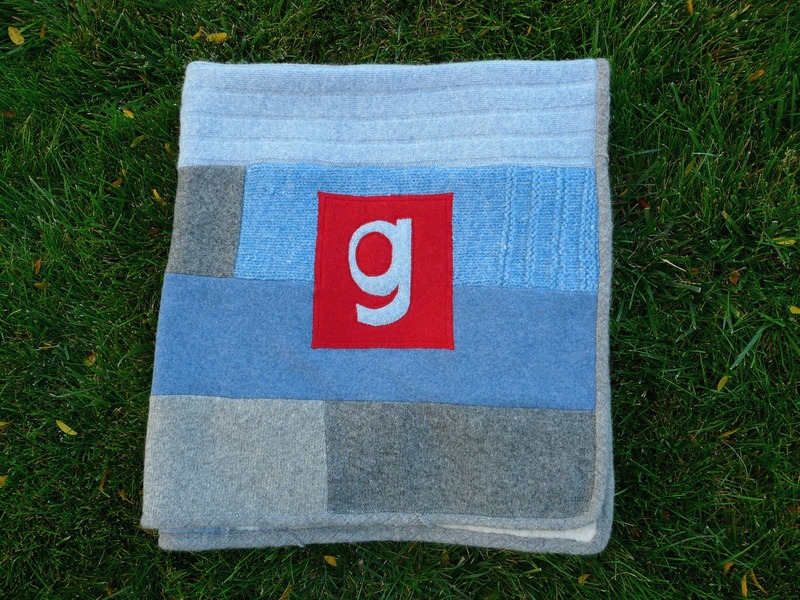 The gray and the blue in this little baby blanket were an easy match to Griffin’s bedroom. And as I pondered what style of monogram to add for his name, the red of that gondola stayed with me. 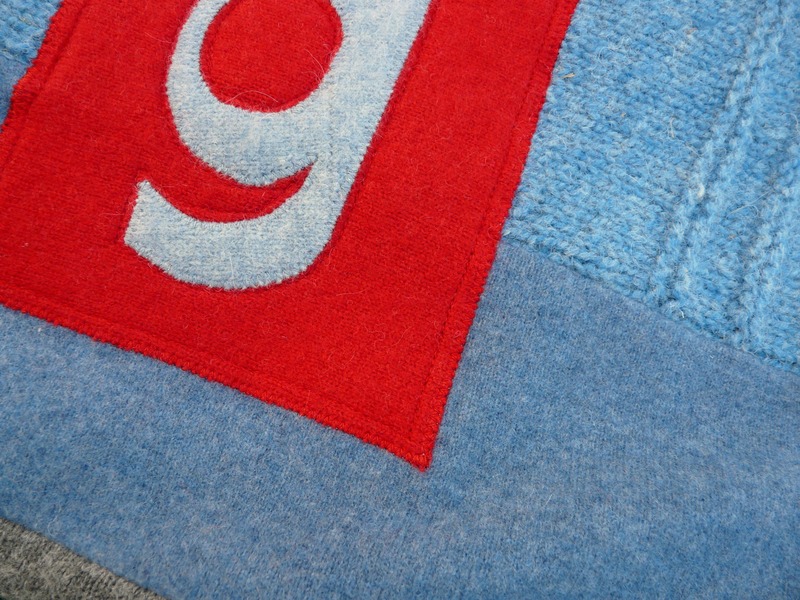 The “g” of the typefont “Open-Dyslexic” by Abelardo Gonzalez adds a good-natured grin. Welcome to this beautiful, amazing world, Griffin. Welcome to an incredible place to explore, with parents who will probably teach you how. I can imagine that tantalizing gondola on your wall carrying your imagination to far-away places. 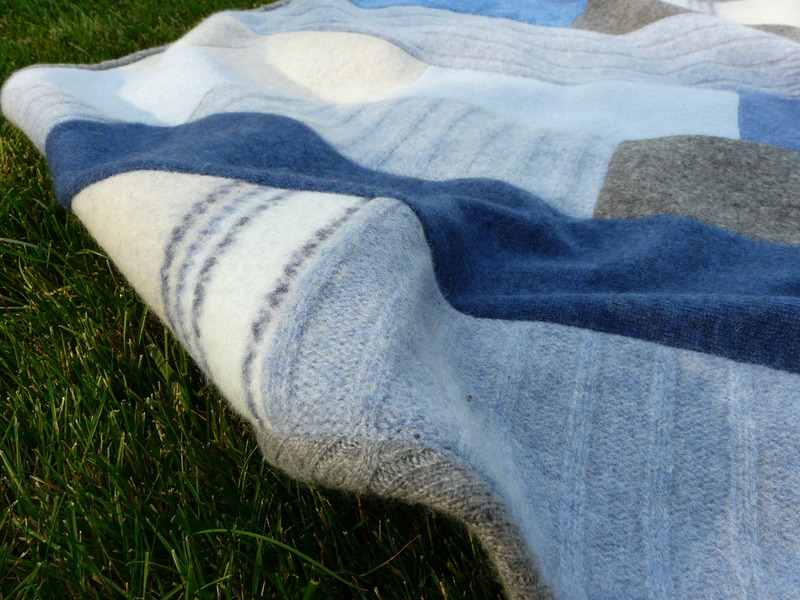 Joan, I received the email with the picture of this beautiful blanket & the name caught me by surprise. This day, two years ago, we lost a very special friend…a young boy who lived each day with such joy, and his name is Griffin! What a wonderful reminder of him! Thank you for sharing this! Ah, yes. I remember. I’m glad this could evoke good memories of him for you. Thank you, Julie. 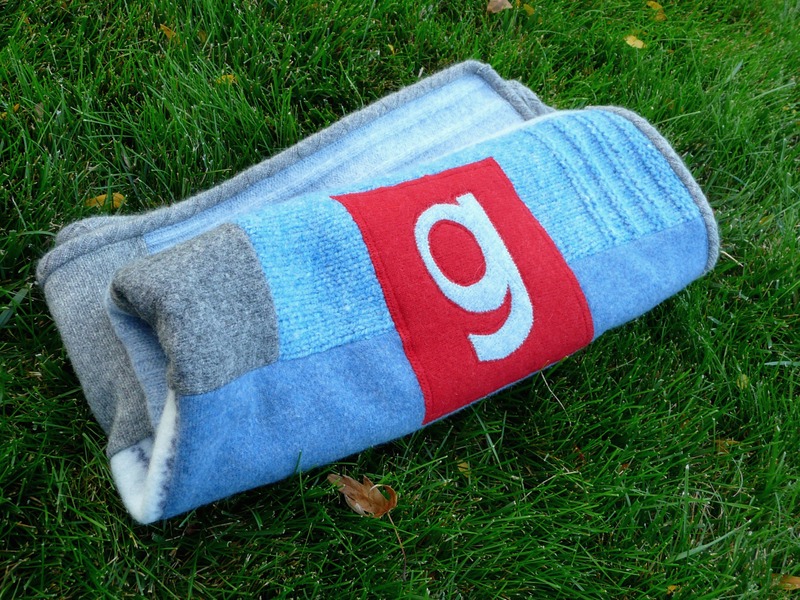 love the story and the backround of the g… this is so beautiful what a Blessing this will be! and I love using lots of different colors. With my love, Aunt Mary. 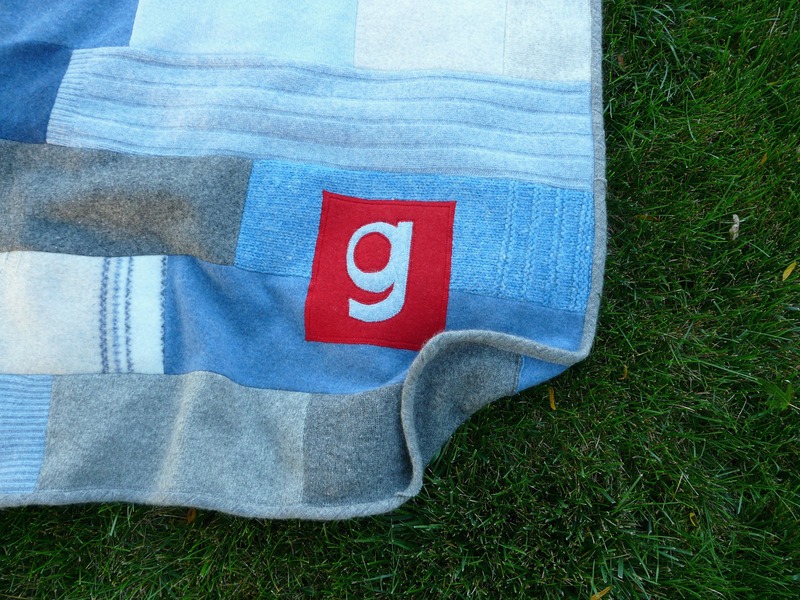 I can’t see the pic of his room, the blanket is lovely and such a happy “g”! Oh, I didn’t post the photo of his room. Thought that might be a little invasive :). So I tried to give you a word picture instead.